It is just over halfway through the year and CARSTAR has already exceeded its annual fundraising goal, supporting the fight against cystic fibrosis (CF). CARSTAR franchise partners, vendors and insurance leaders from both the U.S. and Canada came together at the annual North American conference to raise an astonishing $230,000 for cystic fibrosis research, care and advocacy. Throughout the Momentum 2018 CARSTAR conference, attendees had various opportunities to donate to its charitable cause. Proceeds were raised through purchases of CARSTAR branded socks, participation in the “Walk the Line” charity walk, donations to ride a mechanical bull at the vendor tradeshow and bids on silent auction items all went towards fighting CF. To top it off, the CARSTAR network exuded generosity on the final night at the CARSTAR Dinner and Awards Gala. Franchise partners mobilized, raising nearly $200,000 in straight donations on that night alone. 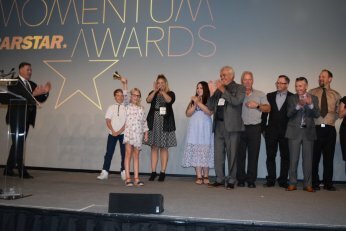 Thanks to the CARSTAR Momentum 2018 conference, the network shattered its annual fundraising goal of $375,000. The current total for funds raised is now at $470,000 with the Colorado Business Group golf tournament still yet to happen. The passion behind this cause has never had more momentum and the CARSTAR network plans to keep it going for next year’s conference in Chicago, Illinois.